We’ve tried growing celery from seed with mediocre results. Then I read that you can re-grow it from the base of store-bought celery. Seriously, all you have to do is plant the stump, ideally from organic celery, and keep it well watered! Some people suggest you root it in a dish of water inside first (directions and photos here), though I skipped that step and planted mine directly in the soil outside and it did just fine. You can also plant it in a container, though it seems they grow faster in the ground. Having it in a pot would allow you to bring it inside, which would be great for the winter. This one’s been in the ground for about two months and is just starting to produce stalks worth harvesting. The outside of the stump dried up fairly quickly, but with steady watering the center soon sprouted and produced new stalks. 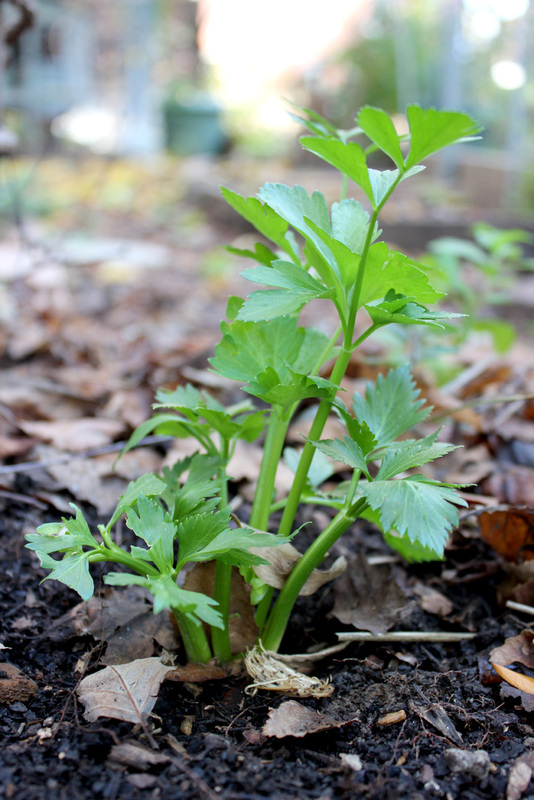 There are a number of benefits to growing your own celery. The best thing, in my opinion, is that you can just cut what you need and leave the rest to keep growing, instead of having a whole bunch of celery taking up room in your fridge all at once (like we used to do). Also fresh celery leaves are great for cooking and can be used as a substitute for celery seed or flakes. Plus the celery will continue to grow new stalks after harvesting. We will probably transplant this celery and keep it inside for the winter ( in milder climates it can overwinter in the ground). Celery is a biennial, so it’ll produce seed in its second year. We may never have to buy celery again!